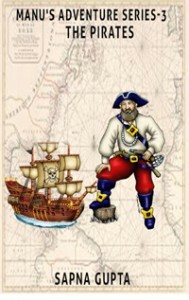 Last week I published my third book in the Manu’s Adventure series – “The Pirates”. Again, it is available as an eBook version only through Amazon through its Kindle books. I have yet to sell my previous eBook – “The Sorcerer”, but at least the books are out and available. The Pirates is about Manu and Maya getting kidnapped by pirates, where the pirates are looking for a treasure. The captain will not let go until he has the treasure. Will Manu and Maya escape or do they help the captain find the treasure? Read it all in the book!! It is very thrilling for me to write that I published my second book yesterday! Manu and the Sorcerer (2nd in the series) is now available as a an eBook now! It is priced at $2.99, hopefully affordable for all. Click here to go the Amazon page to buy this book. I decided to take a different route to publishing this time. Last time I went through a publishing company which charged me money to publish my book; which at that time I did not mind, as I really wanted to see my book published. That was three years ago. During last two-three years Kindle publishing, by Amazon, has really taken off. They provide so much guidance to new authors regarding publishing. I know there are issues that a number of authors have had with Amazon regarding the sales of their book, and I felt morally split about what to do. However, as a new budding author I feel that KDP was really the best route for me. The big publishing companies make it so hard to even reach them that its almost next to impossible for new and small authors like me to get into the publishing field. (Which is why I went the self publishing route the first time.) These days eBooks are gaining ground, and phones and tablets becoming the norm, it seems only practical that I should publish in an eBook format. Regarding KDP (Kindle Publishing) – I have now erased any moral misgivings I had. If the publishing companies are having a hard time selling their books on Amazon, they should look for a different route. Just like we young authors have to look for a different route when it comes to publishing our books. I am glad there are companies that give an opportunity to publish cheaply and make the books quickly and easily available to wide range of audience. I will definitely be publishing more of my books there! !